My name is Amy and I am currently a personal chef in Los Angeles, CA. As part of my externship for my culinary diploma at Le Cordon Bleu, I spent 2 months working at Gusto Al Borgo. It was an amazing experience. 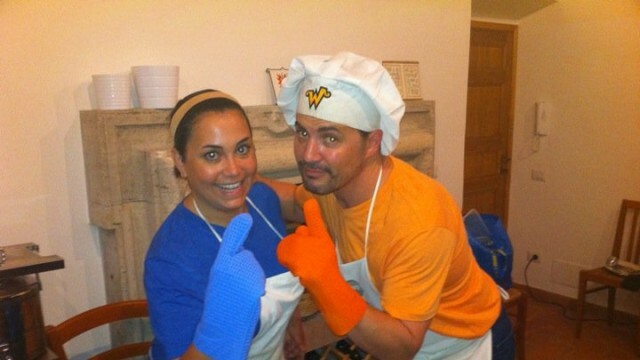 Along with my classmate and friend, Woodie, I learned authentic Italian recipes and techniques including fresh pasta, sauces, soups, desserts, appetizers, meats and of course, limoncello. All the ingredients were local and fresh and we only served what was in season. From teaching traveling tourists how to make fresh pasta, to catering for a local family’s birthday party, each day was a different experience. Paola, Franco and their daughter Cecilia were incredible hosts and teachers. The town of Casperia was a beautiful, magical place, where we got to know the friendly locals almost instantly. My time spent at Gusto Al Borgo helped me become a better chef and left me with life-long, happy memories. I still apply the techniques and skills I learned there in the catering and cooking I currently do for my clients. I highly recommend the Gusto Al Borgo Italian Cooking School !